Summary and Definition: The Caddo tribe were successful farmers and traders who lived an industrious lifestyle in permanent villages of grass houses. The Caddo people occupied a large territory in east Texas, Arkansas, Louisiana, and Oklahoma. They cleared dense pine forests to establish villages and farms in the rich soil alongside the Red River and Mississippi River. What was the lifestyle and culture of the Caddo tribe? The early Caddo tribe were part of a complex agricultural society part of the ancient Mississippian culture of the Mound Builders of North America (700 A.D. to 1,300 A.D.). The ancestors of the Caddo once inhabited part of the ancient Mexican empire, but began to move northeast and finally settled upon the banks of the Mississippi River and Red River in A.D. 700. The Caddo people were they were organized into the Hasinai confederacy consisting of the Kadohadacho on the great bend of the Red River, the Hasinai in east Texas and the Natchitoches in west Louisiana. The friendly Caddoans became allies of the Europeans, and traded with both the Spanish and the French. By the 1800's cloth became readily available and the Caddo began to change their traditional style of dress. The encroachment of the white settlers forced the Caddoans to move in 1859 to a reservation near the Washita River (now Caddo County, Oklahoma) and then on to the Caddo-Wichita Reservation that was established in 1872. Where did the Caddo tribe live? The Caddo are people of the Southeast Native American cultural group. The geography of the region in which they lived dictated the lifestyle and culture of the Caddo tribe. What did the Caddo tribe live in? The Caddo tribe lived in highly organised villages consisting of grass huts. Each village had a temple which in ancient times was located on top of mound that was about 8 feet high and approached by a flight of steps (see Natchez Tribe for more facts). The grass houses were built by using a framework of poles and beams covered with wattle and daub mud. The walls were covered by cane mats and a thatched grass roof which were neat and carefully clipped. The interior walls were also lined with woven mats. The people also built thatched roof structures supported by poles, that provided shade when working. An upright log mortar for pounding corn usually stood near the dwelling. The Caddo were also skilful potters and basket makers. What language did the Caddo tribe speak? The Caddo tribe spoke in their native Caddoan language. Their name derives from a French derivation of the Caddoan word 'kadohadacho', meaning �real chief� in Caddo. The names of the towns of Nacogdoches, Texas, and Natchitoches, Louisiana originate from the Caddoan language. The name Texas comes derives from the Caddo word 'taysha' meaning "friend." What did the Caddo tribe eat? The food that the Caddo tribe ate included their crops of corn, beans, squash and pumpkin. They also hunted for meat from bear, fox, turkey, deer, rabbit and other smaller game. The rivers near their villages provided fish and they also gathered wild plant foods. Food was cooked into cornbread, soups and hominy. The people also grew tobacco and a grain-bearing grass. The Caddo people who lived near saline marshes made salt by boiling brine in large shallow pans. They traded their salt with the Natchez tribe. What weapons did the Caddo use? The Caddo Native Indians were known to be a friendly tribe, interested in trading with almost anyone. Their enemies were the Sioux and the Osage tribes to the North. The weapons used by the Caddo included axes, war clubs, maces, knives, pikes and bows and arrows, commonly made of bois de arc wood. What clothes did the early Caddo wear? 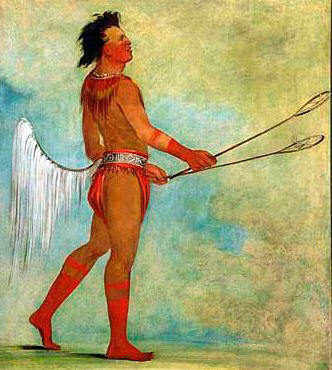 The clothes worn by the early Caddo men wore breechcloths made from bark fabric or from deerskin. The women wore a knee-length skirt, also made from deerskin or a bark fabric. Both Caddo men and women painted their faces for special occasions and also decorated their bodies with piercing and elaborate tattoos. For special rituals and ceremonies the ancient Caddo wore beautiful feather cloaks magnificent feather headdresses. The Caddo Native Indians began to change their style of dress with the arrival of the Europeans. During the 1800's cloth became readily available. They wore leggings and an outer garment called a matchcoat, a blanket that was fastened around the body with a sash. They used strips of cloth, such as wool, calico or silk, wrapped around their head in a turban style headdress which was often decorated with a feather plume. Caddo History: What happened to the Caddo tribe? The following Caddo history timeline details facts, dates and famous landmarks of the people. The Caddo timeline explains what happened to the people of their tribe following the arrival of the Europeans. 1844: The Choctaw alliance ends and the Caddo are expelled as "Indian Intruders"